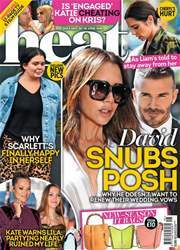 In this week's heat – Lucy Meck's mugged off by Mario, as he's been seeing her AND Chloe at the same time – PLUS another mystery celeb. What a love rat! Also, Lea Michele tries to save 'relapsed' Zac Efron, Tom Daley talks marriage and Simon Cowell shows us his backstage area. Ooer!